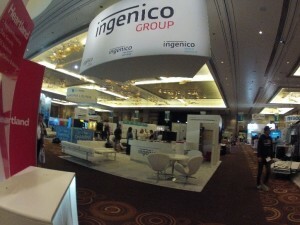 Last week the Ingenico Mobile Solutions team was in Las Vegas for Money2020. The show was a great success (as always) and now as the team settles back into the office in Boston it’s time to reflect and recap the event. This year at Money2020 the big trend among attendees was wallets (Apple Pay, CurrentC, and Softcard). Ingenico Mobile Solutions was part of those discussions as we were demonstrating our ability to accept Apple Pay using the new ROAMpay X5 app and the iCMP chip & PIN reader. Another theme throughout the show was security, mobile payment acceptance and the upcoming deadline for the EMV liability shift. There were dozens of panels, keynotes and sessions that covered these topics, and it seemed as though each and every company had its own take. This year, Ingenico Mobile Solutions was a 4 star sponsor and opened the show with the launch of ROAMpay X5, the first native mPOS tablet app with support for all transactions types: magstripe, EMV and NFC. This new version features a completely redesigned user interface (UI) and is the first and only native tablet application for both iOS and Android that supports all mobile payment transaction types and all acceptance. Attendees that stopped by the booth were excited to see the demo and eager for general availability (Spring 2015). Also on Monday, Senior Vice President of Sales for Ingenico Mobile Solutions, Eric Hoffman presented a customer case study with The Home Depot, where he discussed how mPOS adoption is increasing across all merchant tiers, and how new and innovative use cases are emerging as the market matures. He provided examples of how mPOS is being used in-store, out-of-store, and on-board to improve business efficiencies, enhance customer experience, and increase revenue opportunities for a wide range of industries. Eric then gave Malcolm Nunes, senior manager of Credit Services for The Home Depot, the floor, where he discussed the business challenges that The Home Depot had been facing and why they chose to partner with Ingenico Mobile Solutions to develop an innovative mPOS solution for their network of in-field installers/contractors. Malcolm explained how this new mPOS solution is enabling these installers/contractors to accept orders, access schedules and maps, adjust orders, and collect payment while out in the field. Monday night the team attended the Intel reception at the Gold Lounge in the Aria where they demonstrated an EMV-enabled mobile point of sale (mPOS) solution that’s fully integrated with Aava Mobile’s ruggedized Inari tablet. The reception was jam packed and the feedback from attendees was fantastic! On Tuesday, Senior Vice President of Market Development for Ingenico Group North America, Rod Hometh sat on a panel entitled “From Theory to Reality: Deploying Payments Solutions in Retail.” During the session Rod shared information about how retailers should be prioritizing both security and consumer experience and what retailers should be doing to implement a successful omni-channel strategy. The show wrapped up on Wednesday with record high booth traffic and more demos. Overall Money2020 was a huge success. The team met with customers, partners, press, analysts, industry experts as well as hundreds of attendees that were interested in learning more about our mobile solutions. Through these discussions, the team was able to share new and innovative ideas that they’ll take back to the office. The Ingenico Mobile Solutions team is now back in Boston, ready to roll up their sleeves and apply the knowledge they learned. If you weren’t able to stop by the booth or want more information on ROAMpay X5 or any of our mobile payment solutions, leave a comment here, send us an email, or if you’re planning on attending NRF in January visit us at booth #1743.